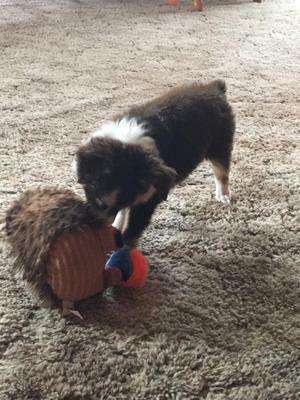 Today I took my Mini Aussie pup Mihko to the vet and she weights 5lbs 6oz. I don't know if it is normal for her weight? She looks so tiny to me. She is pretty healthy and active. At 4 months my miniature Aussie female named Brandy was 17 pounds and considered normal in size and weight. Brandy has the exact opposite eating habits you describe. She eats everything, and eats much to fast. She particularly loves raw baby carrots as a treat as does Doogy our terrier mix. Is it possible your Aussie is a toy, not a miniature? We had to stop chicken based dog foods due to severe itching on both dogs. Lamb and salmon based dog foods are working well and the frequent scratching had stopped. I'd suggest cutting back on the treats and try different food flavors or size of bite. A hungry dog will eat dog food. A spoiled dog will hold out for favorites.